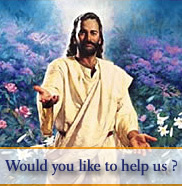 URGENT PLEA FOR HELP: Now Jesus4UsAll needs your prayers and help and support. Help our MISSION GROW and Succeed! Dear brothers and sisters’ in Christ. At the beginning of July our webmasters gave us a Termination Notice. This followed some queries’ we had about the incorrect formatting of the source code on our home page header. The internet needs this to be in a certain format in order to improve its ranking and traffic. Following this notice we set about to find a new webmaster and hosting service. When we found one, we informed our old webmaster to let them know so that they may co-operate with them in the planning and transfer of the technical aspects of the website, email controls, etc... to the new webmaster. In defiance they wrote back stating they were not willing to communicate to any third party. This let us bewildered and at a loss, since this would be essential for the successful move of files from the old server to the new one. The Termination Notice they had given us gave us until 31st December 2010 to have moved from our old webmaster and their server to the new one. On the 5th August 2010 we got an email from our old webmasters stating falsely that we had contacted a supplier of theirs giving them a bad name. They also stated that with immediate effect their services to us would be terminated, and with that, they blocked our website from appearing on the internet. I would like to add here that our payments to them have always been to pay them in advance and that our account on the 5th August 2010 was in credit and paid up for their services up to and including 18th November 2010, yet they still were determined to cause damage to www.jesus4usall.com. At this point I emailed all my friends to let them know of these developments and asked for their urgent prayers and support. Many of them replied and some offered financial assistance. We thank gratefully and pray that the Lord gives them back 100 fold for their charity. Yesterday we managed by God’s grace and the co-operation from our webmasters to restore our presence on the internet. Today, we are in the process of trying to restore our restore our email accounts, and our website statistics site, which gives us the analytics of our website. Total needed to ensure minimal works are £1,590. How you can help us continue to build and grow, in spreading the Good News of the Gospel of Jesus Christ and the message of Salvation. 3. Promote our site to your prayer group, friends and family. Just send them the link to our home page, www.jesus4usall.com. We are sure that the Lord is in this transition and with his grace and your help we will come out on top, out better, and bigger for the glory and kingdom of our Lord Jesus Christ. I thank you all in advance for your prayers and support. I am humbled to have to in on this kind of information, but the world is not our friend, and we must overcome the world just as Jesus overcame the world, with faith and with love and with unity in the church. The Church is being persecuted online as much as offline.